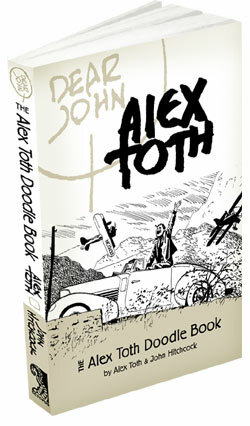 Alex Toth is an original, a supreme storyteller and illustrator. Toth began his career in 1946 with Heroic Comics, and since then, he has drawn a variety of comic book titles in every genre imaginable. 'Johnny Thunder' for D.C. comics, war stories for Harvey Kurtzman's 'Frontline Combat', romance comics at Standard Publications, 'Zorro' for Dell, horror tales for Warren Publishing, and creating 'Space Ghost' for Hanna-Barbera are just a few career highlights. "Dell Comics are good comics". So read the house ads for wholesome Dell comics, a staple of the 1960's comic book racks. 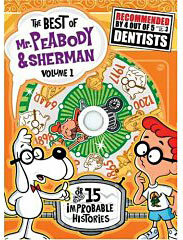 Dell Comics specialized in movie adaptations and Disney characters, but as wholesome as they were, Dell did not carry the Comics Code Seal of Approval that every other major publisher displayed. Instead, Dell comics contained 'A Pledge to Parents' which states: "The Dell code eliminates entirely, rather than regulates, objectionable material." Alex Toth drew some of the most fondly remembered titles published by this company in the late Fifties and early Sixties, and they remain some of his best work. This is an amazing 32 page effort by Mr. Toth. 32 pages, there are no ads in Dell comics, no filler text, just first rate artwork here. Most of Toth's Dell stories are a full 32 pages long, and what a treasure they are to behold! Toth illustrated the Disney 'Zorro' comics published by Dell, and they stand out as superior examples of comic books done well. When I talked to Mr. Toth recently, he remembered this issue well. When the comic book was shown to the sitcom star, Danny Thomas complained to Dell that Toth had drawn his nose too long! Another 32 pages of Alex Toth being fresh and cartooning at his best. Funny, brilliant, almost in 'bigfoot' style, this was the last book Alex Toth drew for Dell comics. Note the 15 cent price in 1962, when all others were 12 cents. I just love the cover, and the short 5 page Toth story inside. Alex Toth set the standard for the other comic book artists of the fifties and early sixties with his crisp, economical lines and simple, expressive storytelling. Artists at the time were told by their editors to 'draw more like Alex Toth', and his work was an inspiration for up and coming comic book artists for many years to come. Drawn by Alex Toth, this comic book adaptation of the famous John Wayne film is a lot better than the movie itself, in my humble opinion. Sorry John Ford. The artist had a problem with this project, however. When John Wayne saw the original art, he decided he didn't want his likeness used in comic book form, even though Toth had no problem drawing the Duke. This meant that Toth had to go back and change all of the John Wayne heads throughout the story to look less like the actor. This Dell comic gives us 34 pages of superb Alex Toth art, and no ads, all for 15 cents. What a deal! 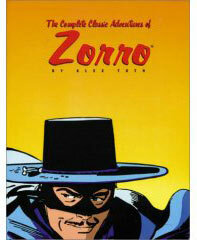 Toth's run on the Zorro series is legendary to his fans. Swashbuckling sword fights and exotic locales are a Toth specialty. This is the first issue of Toth's eight issue run on the Zorro series, note the attention to the draping of Zorro's cape throughout the comic. It's very abstract in nature, I love it! Many people consider this issue to be Alex Toth's finest work and I can see why. The story is a simple detective yarn with two young kids as the protagonists, and the city of London as a backdrop. Toth's pacing is brilliant, and this comic book is superior storytelling in the grand master's hand. This issue is a nice change of pace from these other examples, Toth uses his broad animated cartoon style here to great effect. He really captures the freewheeling sense of the Walter Brennan television comedy. Luke! Pepino! Come quick! You can read the one page story from the back cover right now, just click on the cover!